James Branch Cabell is rarely read anymore except by historians of American fiction who take an interest in what was popular in the teens and twenties. His most famous book, Jurgen, was published two years later, suppressed for obscenity, and naturally became a best-seller as a result. His work is hard to approach at the remove of a century, since the mode he primarily worked in — "romance" in the sense of heroic fantasy with vague gestures toward historic plausibility — has entirely vanished these days, having been replaced by either heroic fantasy in the Tolkienian mode of entirely fictional worlds, or historical fiction which wears both copious research and emotional plausibility on its sleeve. Cabell cares neither for historical accuracy nor emotional plausibility — his purpose is essentially satiric, even when his devices are fantastic. 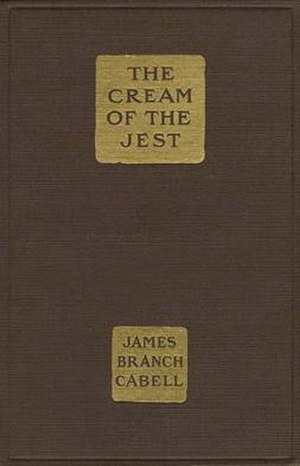 The Cream of the Jest is presented as a sort of nested series of fictions, the report of one scholar on the literary imaginings of another, which latter wanders in and out of his own fictional worlds as well as those of others. Apparently, anyway; and part of the point of the novel is how vanishingly impossible it is to know what other people actually experience, how they feel, what they are in essence. Felix Kennaston, the story's supposed protagonist, is less a fully realized creation than a collection of stereotyped attitudes (including a wry self-portrait by Cabell), no less conventional as a cynical philosopher than as a dashing, romantic hero. In one way this novel is a critique and a rejection of swashbuckling, cavaliers-and-fair-maidens Romance; in another way it's a serious attempt to reconcile it with the modern, mechanical world. I don't think the attempt is entirely successful, in part because the point of Romance (and of later fantasy) was to reject 19th and 20th century modernity, but also in part because, despite his prodigious literary apparatus (his prose was greatly admired by reviewers in the teens and twenties as being a unique synthesis of seventeenth, eighteenth, and twentieth century prosody), he is ultimately less interested in precision than in sonorousness, and correspondingly less interested in truth than in atmosphere. He reads mellowly, with a deal of enjoyment along the way, but at the end you realize that you haven't actually been told anything new. The book's underlying themes are Modernist, but its style is anti-Modern; which means that it's constantly working against itself. There's still enough humor and fine prose — and the central imaginative conceit of the book is striking enough that in a less puffily discursive writer it might have amounted to more than a wisecrack about marriage — that I'm glad to have read it. I am probably going to end up reading more Cabell sooner or later, and I prefer his satirical fantasy to having to slog through the extremely serious-faced heirs to Tolkien or Robert E. Howard.